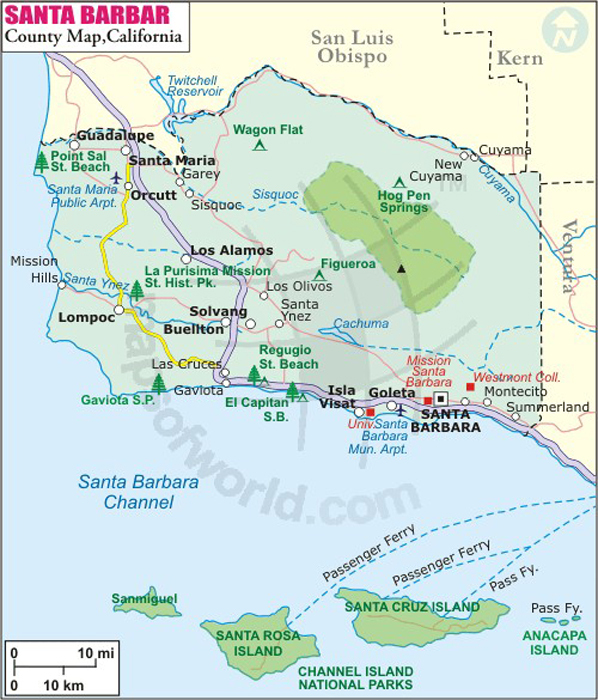 Below is the County Map of Santa Barbara in California showing the boundaries, roads, highways, towns and much more. Santa Barbara is the second largest city and the county seat of Santa Barbara County in Southern California. Situated along the south-facing Pacific coastline, the city is bounded by the Santa Ynez Mountains and the Pacific Ocean. Due to its pleasant, year-round Mediterranean climate, it is often promoted as the 'American Riviera'. The area was incorporated as a city on April 9, 1850. The city is located about 90 miles (145 km) northwest of Los Angeles. Nothing is more emblematic of Santa Barbara than red-tiled roofs under crystal-clear skies. The city is renowned as a popular tourist and resort destination among Californians, especially for surfing. Mission Santa Barbara, Stearns Wharf, Santa Barbara Zoo, Botanic Garden, and Casa de la Guerra are some of the most visited attractions in the city. Acres of unspoilt wilderness of the Los Padres National Forest is only a short drive away from the city. For those willing to have aquatic adventures, beautiful scenery and marine habitats of Channel Islands National Park and Channel Islands National Marine Sanctuary lie roughly 20 miles offshore. The Santa Barbara International Film Festival and annual Summer Solstice Parade draw in thousands of visitors to the city. By Air- Santa Barbara Municipal Airport (SBA) is served by regional airlines. By Train- Amtrak operates Coast Starlight and Pacific Surfliner routes through Santa Barbara. By Road- U.S. Route 101 passes through the downtown area.